The summer holidays are over, and even families not going back to school, are heading back to our ‘term time’ routines. Or at least this one is! We might not have a daily school run, but many of our extracurricular activities and clubs run on a term-time timetable, so it forces us into that kind of schedule. That means that things like cleaning and domestic activities need to fall into a routine too, to make sure that they are actually done. Another thing I like to do at this time of year is a bit of de-cluttering, clearing out, packing away of things that we won’t be using over the winter months. Our house is small, and we don’t have a private garden, so it’s essential to my mental well being that we have space around us. Of course, with a five and a three year old, I don’t feel the need to do every little thing myself, and getting them involved in household ‘chores’ is important – as is cleaning up after themselves. 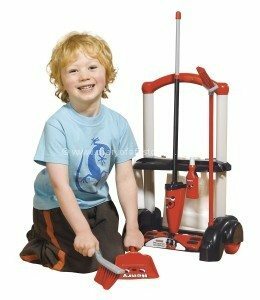 While the children really can use general house hold cleaning equipment – a broom, a brush and shovel, or a mop or duster – when we were sent the Casdon Hetty Cleaning trolley for review, I was quite pleased that they took a sense of ownership over their tasks. They certainly view them as ‘real’ cleaning equipment. 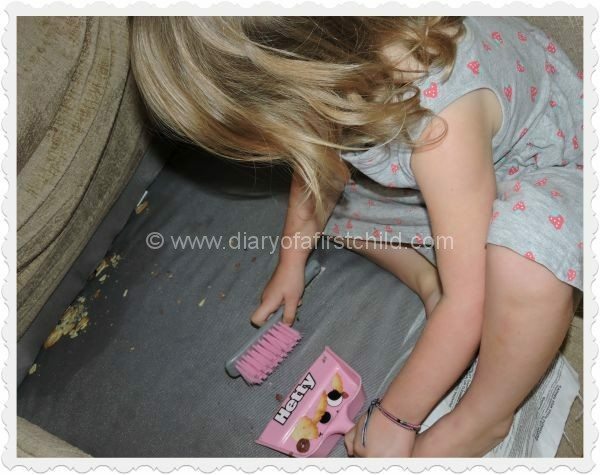 Recently they were sitting eating crackers on the sofa – which they aren’t allowed to do, because of course, the crackers tipped over and ended up down the back of the cushions! I helped them take the cushions off, and they had to clean up the mess themselves, so off they trotted to their cleaning trolley, and grabbed the brush and shovel for the sofa and the broom for the floor. The Casdon Hetty Cleaning Trolley comes with stickers to decorate your equipment, but aside from that it’s all pretty quick and easy to put together. The kids helped their dad and they quickly built all the parts. The only problem I have with this trolley set is a pretty obvious one: it is painfully pink, and there’s really no need for that. The “boy” version called Henry is red. Much nicer! All in all for the RRP of £15 (At the time of writing it’s £10.99 on Amazon*) it’s pretty good value, and makes a nice addition to the play kitchen. We used this printable chore chart from Tinyme to make up our own chores, which the kids can do with their cleaning trolley, which helps me a little around the house, but more importantly, gets them involved with the business of a hygienic lifestyle from a young age – which is as important as learning to be a doctor or scientist or whatever other ambition they may have for their future.